Being Frugal and Making It Work: First Day of Spring 2018 and FREE Ice Cream Cone Day! First Day of Spring 2018 and FREE Ice Cream Cone Day! Not only is March 20th the First Day of Spring and my 19th wedding anniversary... it's also FREE ICE CREAM CONE DAY at Dairy Queen! 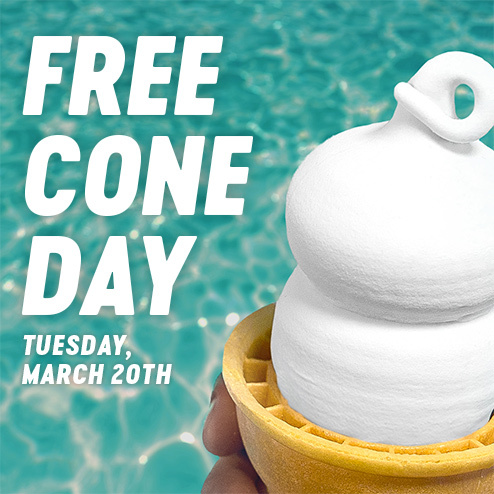 DQ® Fans, come get your first taste of summer on the first day of spring, tomorrow, Tuesday, March 20th. Stop by Free Cone Day at a participating DQ® for one free small vanilla cone* made with our world-famous soft serve. *Free small vanilla cone at participating non-mall U.S. locations. Not valid in Canada. All day, limit one per person. While supplies last. Swago: Spring Edition is here!